Winner of 15 Group 1 events, Simon Marshall was Australia’s premier weight-for-age jockey in the early to mid-90s. Riding such stars as Super Impose, Naturalism, Better Loosen Up, Hareeba, Poetic King, All Our Mob, Mahogany and Mannerism, he was king of the turf. The son of a jockey who took up training after a bad race fall, Marshall’s career began in the idyllic country town of Cranbourne, Victoria. Marshall was born to ride. He had his first fast gallop at the age of 11. Throughout his career Simon was plagued with weight and size problems. He simply was growing too much to stay in the saddle. Dieting became second nature for Simon from the tender age of 14. Simon would fast and lay in a sauna for days simply to be the correct weight for race day. Winner after winner, Marshall would rise above the pain of and simply ride on adrenalin. Major victories in all premier racing cities including the Australia Cup, Australia Stakes, Mackinnon Stakes and South Australia Derby, Simon was at the top of his game. However, years of dieting simply took their toll on the ‘pocket dynamo’ and Simon was forced to retire in 1997 after collapsing in the jockey’s room at Caulfield. The thought of early retirement would never phase Simon as he quickly grew a promising media career. However the desire to ride again became too much and Simon successfully made a comeback in 2002 for two wins from just three starts after using biochemistry to lose a staggering 14kg. Despite his weight problems, Simon rose to the top of the turf achieving a metropolitan win rate of 28.6% – the highest of any jockey in recent history. Over 700 winners to his credit, Simon, has been recognised by both Gai Waterhouse and Lee Freedman as having no peer as a tactician in weight-for-age races. Since retiring in 2002, Simon’s career has gone from strength to strength with regular spots on television and radio for his in-depth knowledge of not only racing but sport in general. 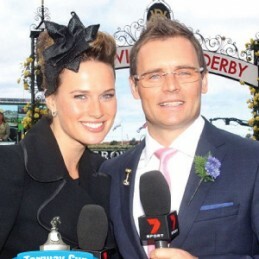 Not only can Simon be seen on Channel 7 throughout the Spring Racing Carnival with esteemed racing commentators Bruce McAvaney, Francesca Cumani and Richard Freedman analysing the ins-and-outs of racing. He also heads up the Racing team at Sportsbet. Simon is constantly in demand as a corporate MC, his wit and charm is infectious!